i'm not talking about that silly game that people "play" so that they can get all touchy on each other. i'm talking about the movie. actually, not the movie itself, but the attraction at universal studios in florida that was inspired by the movie. the attraction is named "twister..ride it out" but there is no actual ride. it's a simulation where you stand in a room and watch as a twister comes and destroys a 1950s barn town. the intro is laughable as you're waiting to get in the room. 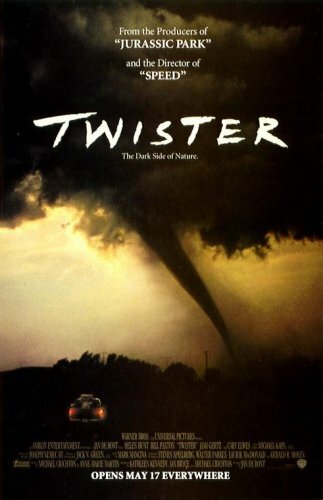 you get to watch video of bill paxton lazily tell you how dangerous a twister is in his overacting goofy way. you stand in rows on this platform that is designed to look like you're under an awning, presumably of an old wooden building. you look out from your platform to this scene of a small section of town at night. there is a drive in movie screen, an old 1950s style car, an old movie theater marquis, maybe a diner looking buiding, a bunch of trees, and a powerline. the powerline is the key ingredient here. well... besides the actual tornado of course. you see the twister approach from afar through dim lighting, it gets closer and you see trees blow around and water splashes you a little. then you see a really small tornado in front of you that is real. then there are some sparks (i think it is to simulate lightning) and you watch the buildings rip apart. a cow flies in front of the audience. the old timey car gets pushed into a fire hydrant spewing water everywhere on the set, and the awning blows around as the tornado gets closer to you. the powerlines rumble around and ignite the water from the hydrant and there is fire to dazzle the audience for a few seconds. then the awning is ripped away and collapses as your platform falls a few inches and the lights go out and everything is calm again and bill paxton says "thank you for surviving twister," again in his uninspiring voice. well here's the clincher. here's the truth. here's what i see happened that can be the only logical explanation of what we just watched. you, the audience, die in the twister. to recap: the twister comes close, the town is ripped apart, it comes for your awning, you are flown through the air as it is destroyed, everything turns black and silent. you died. i hope that bill paxton isn't the one that i see after i die like it is on this attraction at universal studios. This doesn't seem like a very good way to spend park time. What next, volcano, hurricane, tidal wave? The dark part is enough to scare me.